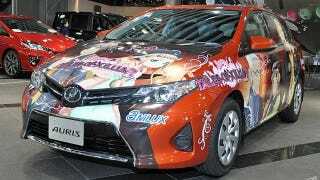 Like the Tales of Xillia 2 bus, here's a pair of cars (Auris and Aqua) that were turned into Tales itasha. They were spotted by CNET Japan at a Toyota showroom in Tokyo's Ikebukuro as part of what looks like a viral campaign to promote Tales of Xillia 2. Does this mean most Tales players are Toyota owners? Or prospective Toyota owners?